HAASS: Well, good afternoon. I’m Richard Haass, and I want to welcome each and every one of you to the Council on Foreign Relations and to this year’s International Affairs Fellowship Conference. This is the 51st year of the program, which resonates with those of us who were born in 1951. I was excited about this program as anything what we do. It’s—you know, we’re in the ideas business and when people ask what we do I always say we’re in the—you know, we produce and we disseminate ideas. But the other thing we really do is— we invest in people, and the IAF program, over the years, I would argue—speak in New York talk—the ROI—the return on investment is about as good as it gets. This program was, you know, again, created in ’67 and essentially it was to create two-way flows—to take—the goal was to create scholar practitioners. So we wanted to take scholars and others who hadn't had the government experience and give them a tour in government and we wanted to take people in government and give them a little bit of a sabbatical—a chance to take a step back and think some bigger thoughts, and we’ve done just that. The numbers are impressive. Over this half century, there have been now over 600 International Affairs Fellows. One or two have actually garnered a bit of attention—Condi Rice, Samantha Power, Jim Stavridis, who’s on our board now as dean of the Fletcher School, Ivo Daalder, former ambassador to NATO, and even our own Jim Lindsay, who is our senior vice president and heads the studies program here, and I think 15 of our senior fellows were also at one time or another. So at least it’s a job path in one direction. We’re also growing. Besides the IAF that you’ve all participated in and have come to know, it’s now about two decades since we started the program of sending an IAF to Japan. Hitachi has been an extraordinary partner with us over the years and Carl Green was the person who really shepherded the program. It’s so good that it became a model for other IAFs around the world. We’ve now got one in Canada and we’re looking to create them in other countries. And over the years, like, we’ve, what, we sent maybe 40 or 50 Americans to South Korea, and what it does then is it really gives us a cohort of Americans who have a real feel for what is going on. What is that, the eleventh largest economy in the world and a(n) increasingly, obviously, important country central to what’s going on. In 2011, we created a—established the IAF in nuclear security, and this was sponsored by the Stanton Foundation, and the idea, again, is to get people in the scholar practitioner space and they work here in the government on these nuclear issues for a good chunk of time. We’ve also now got an IAF in international economics sponsored by Kimberly Querrey. We’ve got an IAF tenured in IR scholars. So, as you can see, we’ve got a lot going on. Eight—the eight current IAFs in the current class are working on all sorts of issues—cyber security, State Department reform, U.S.-Korea relations, CBMs for peace processes, state-owned enterprises in Latin America, or, as we like to say, SOEs in LA—competitiveness in trade, and so forth. They’ve been placed, besides in the government, at Brookings, JPMorgan, Carnegie, the Woodrow Wilson Center, and here. I want to congratulate all nine of the members of the incoming 2018/2019 class, and just so everybody knows who everybody is, why don’t all the past, current, and future IAFs stand up, just to get a sense of who’s—how many we got here? OK. We have quantity as well as quality. This is great. Well, thank you for coming indoors on an extraordinary spring day in New York. This program doesn’t just happen. There’s not spontaneous combustion. It takes a couple of talented hardworking people. I want to thank Janine Hill. Janine, make sure everybody knows who you are. Let me embarrass you. Stand up. (Applause.) And Janine doesn’t do it—as good as she is she can’t get it all done by herself. She works day in, day out with Victoria Harlan and Jackie Sirq (ph) in all this. So thank you both for what you guys do. OK. Today, we got, as you know, an ambitious agenda on all sorts of issues and we’ll all run from now through about 5:00 and there’s also various breakout sessions. 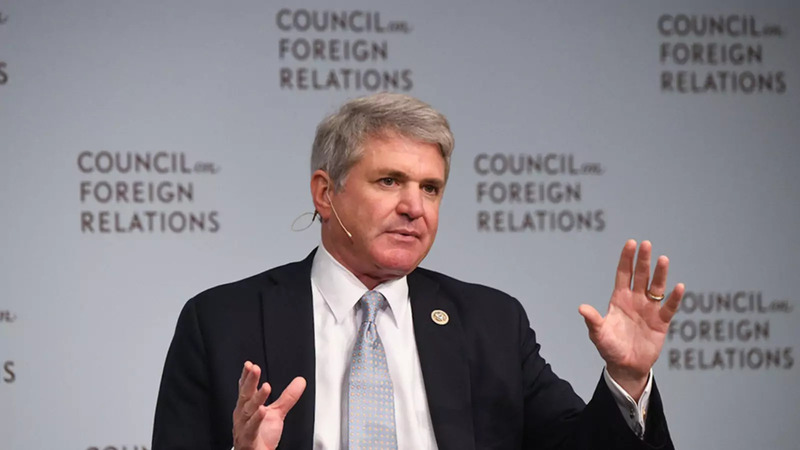 But we’re going to start with, again, Jim Lindsay, an IAF graduate, and our keynote speaker, Congressman Mike McCaul, who’s the representative from Texas and, on top of that, is the chair of the House Committee on Homeland Security. LINDSAY: Thank you, Richard, for those opening remarks. I want to welcome everybody here and, obviously, extend congratulations to all the new IAFs. I think you’re going to find it to be a life-changing experience. I know it certainly changed the course of my life. We’re very excited today to have Congressman Mike McCaul here as our guest. He is currently serving in his seventh term as representative of the 10th Congressional District in Texas. Now, for those of you who aren’t familiar with geography in Texas, let me sort of lay it out for you. The 10th Congressional District runs from sort of the suburbs of Houston all the way through—it includes Austin and goes slightly north. So it’s, in some ways, a microcosm of the United States. You have the suburbs of Houston. You have the high-tech in Austin. You have small towns in between, places like Pflugerville and Sealy—yes, that is the home of Sealy Mattress. LINDSAY: It’s a great place. I used to live there. I’m a big fan of it, and I’ll also note that the 10th Congressional District is the seat that a young politician named Lyndon Baines Johnson held way back in the day. Now, as Richard mentioned, Congressman McCaul is Chairman McCaul. He is the head of the Committee on Homeland Security. He’s headed that up since 2013. He is also a senior member on the Committee on Foreign Affairs, and you are a member—actually, you chair the U.S.-Mexico Interparliamentary Group, and I’ll note tomorrow you’re being honored by Ellis Island and receiving their Medal of Honor for your work on immigration. So let me just say—congratulate you on that. LINDSAY: I’d say we have a full agenda of things we can discuss and I’ll pick it out of a hat. Let’s start with Iran. Obviously, this week the president announced that he was withdrawing the United States from the Iran nuclear deal, formerly known as the Joint Comprehensive Plan of Action, or JCPOA. He took that step even though the U.S. intelligence community says that Iran has been complying with the terms of the agreement, and he withdrew the United States even though three of America’s closest allies—Britain, France, and Germany—came up with a plan worked out in cooperation with Trump administration officials that addressed many of, but not all of, the president’s concerns about the deal. So did the president, in your view, make the right call? MCCAUL: Let me first thank the Council on Foreign Relations. When I first decided to run for Congress, it was—the first speech I gave was before CFR. You’re a great resource for us on the Foreign Affairs Committee—a great resource—and thank you for having me. And, Jim, I appreciate it. There’s no shortage of news out there right now and it’s a very, I would say, very dangerous time but also a time of opportunity. The JCPOA—it’s no secret I was against it from the beginning because it didn’t have certain elements in it, particularly, the inspections anytime, anywhere—if you can’t properly inspect it’s hard to know what’s happening—secondly, the ballistic missile capability, which Iran has ramped up since the agreement was signed. They had 15 U.N. Security Council violations by launching these missiles. So we had seen violations, and it didn’t end their nuclear program. It, in fact, guarantees that by 2025 that we will have a nuclear Iran. So, in respect to what the president did, I sat down with the State Department. At the time, the E3—that’s Germany, France, and Britain—were working on these three areas, that being ballistic missile capability, inspections, and sunset. When Macron gave his speech to the Joint Session, we were very encouraged to hear him voice his commitment to those three areas. I think what—where he got tangled up was on the sunset provision, particularly with Germany. And I think what the president is doing is putting sort of maximum pressure, just like he’s doing on North Korea. It’s a 90-day period with the first sanctions and then a180-day period before all the sanctions are lifted. I visited a lot with President—or Prime Minister Netanyahu in Israel. He considers this to be his number-one threat, not ISIS, who I’ve been tracking for the tenure of my chairmanship, but rather this empire—foreign adversary next door that has taken what he calls is the Shia Crescent, and that is Iraq, Syria, and Lebanon. And we saw just recently they launched 20 missiles into the Golan Heights, defeating the Iron Dome, which is what they’re very, very concerned about. They believe that this was a bad deal as well. My instincts were—and in the last administration I know that the intentions were certainly well-deserved, but it just seemed to me they just wanted a deal, not the best deal that we could get. And I think it had certain elements that need to be strengthened to make it a better deal and I think that’s what the president is trying to do here. LINDSAY: So are you—you see Plan B then as this is a move to try to force a deal? MCCAUL: I see this as a—yeah, I think Plan B is a(n) intense negotiation, 90 to 180 days out to put maximum pressure to get these key elements I discussed in the overall plan. Now, we had a Foreign Affairs hearing and I asked the panel witnesses would Iran ever agree to this. But I think—I think—I think they would because if the United States is out of this deal, it’s very difficult for the whole thing to continue with Europe because then they’re put in a choice between do I do business with the United States or Iran. So this is—you know, what you want to do is put maximum pressure so your diplomats can resolve these issues, not unlike what we’ve been doing I think somewhat successfully in North Korea. LINDSAY: But in doing that, there’s, obviously, the potential that you won’t get a deal—that the Iranians will sort of follow the lead of the Pakistani leader, Ali Bhutto, who said his country would eat grass in order to get nuclear weapons. How do you deal and how would you propose to deal with that potential outcome? You note that the verification regime in Iran is not ideal, but it’s certainly a lot better than a lot of places we can go. We’re at the risk of losing that and then, in that sense, losing sight into what it is the Iranians are up to. MCCAUL: Well, I think that’s the greater risk, right—that we all have to be honest about that, that is, and I think—I thought the president was going to extend the timeline on these negotiations and he essentially sort of is with the 90- and 180-day timeline. Verification, I’m not so sure. I serve with Mike Pompeo. He’s now secretary of state. He, at the time, was very concerned of our inability to inspect military sites where we know they would be conducting a lot of the research and development for their ballistic missile and nuclear weapons program. You mentioned Pakistan. I mean, it was A.Q. Khan, interestingly—Pakistan—who mastered this and proliferated it to Iran and then to North Korea, and Iran and North Korea have been playing side by side. This is a high-risk game and I, you know, you want to be optimistic that the outcome is going to be a better deal with Iran and then we’ll be able to, in working with North Korea, ensure that neither one of these countries will be a nuclear power because both of them create an existential threat to the United States, and I think North Korea’s ICBM capability that they demonstrate clearly shows that they are capable of hitting not just Japan or South Korea but this continent as well. LINDSAY: You had been pushing before the president’s announcement for ratcheting up sanctions in Iran. You had—you sponsored H.R. 4744, the Iran Human Rights and Hostage Taking Accountability Act, which has been reported out of the committee. Do you intend to continue with that or has the president’s decision sort of overtaken that legislative effort? MCCAUL: No. You know, I introduced this bill, which denounces the human rights violations in Iran, which are widespread. This is a very brutal regime. They’ve also taken five Americans hostage. And so my bill will provide sanctions for anybody that’s involved in taking Americans hostage in Iran, and I think you juxtapose that to what we just saw with North Korea where they released three American hostages. That should have been the game plan, I think, with Iran. And I think the flaw of the Iran deal was we didn’t get concessions enough before we released the sanctions. Remember, Congress had been working for years to get a—in passing sanctions to get Iran to a place where they would release our hostages, where they would denounce their ballistic missile program, and they would denounce their nuclear weapons ambitions, and I don’t think we got any of those. LINDSAY: OK. Well, let’s stay on the nuclear topic and move across the world. Let’s talk about North Korea, which you’ve already mentioned. Now, back in March, you wrote at op-ed in which you listed all of the times in which the North Koreans promised to reform themselves and behave and then reneged on those promises. Two days later, President Trump surprised I think pretty much everybody by announcing that he was willing to go and meet with Kim Jong-un. Just this week, we’ve learned it’s going to be on June 12th in Singapore. Is it a good or a bad call on the president’s part, given North Korea’s record? MCCAUL: (Laughter.) And I would like to quote a CFR document that really goes through the history of North Korea and how many times they’ve played us in the international community in terms of, you know, unfreezing assets to lifting sanctions, and every time we did that first before we had the talks and every time they talked and then they later resumed their nuclear weapons program and then also got out of the nuclear nonproliferation treaty, which was hugely significant. Do I think it’s a good idea? This will be the first time a sitting U.S. president has met with the Kim family—with one of the, you know, presidents. So it is—it’s a big—in that sense, it’s a bit of accomplishment for Kim Jong-un. But I think when Mike Pompeo was dispatched on the same day of the Iran deal being revoked, it wasn’t by coincidence that those three Americans came home. It was by design, and I think what he told the president of North Korea was we need you to have good-faith concessions before we even get to the negotiation table. So I think the three Americans being released was in good faith but I, you know, to your point, do have a healthy amount of skepticism and I think the administration’s not—they’re open-eyed to the track record, you know, of North Korea. Let’s not forget Otto Warmbier, who was released from North Korea as a student and then shortly died thereafter because he was so brutally treated by the North Koreans. But, you know, the axiom never negotiate out of fear but never fear to negotiate, I think they have shown some good faith. They have stopped their missile tests. Now we want them to shut down their nuclear facility. The difference between the Iran deal and this, though, is that we—I think we have an administration that’s willing to walk away from the table. With the Iran deal, I felt it was very much we’re going to stay at the table until we get a deal no matter what that deal is, just to get a deal. LINDSAY: Well, let me ask you about that. What exactly is it that the administration should stay at the table to get? And I ask that because, obviously, the administration has taken a maximalist position. They want North Korea to denuclearize, get rid of all of its nuclear weapons. Most of the experts I talk to who follow North Korea, both here and in Korea, say the probability of that is vanishingly small. Many of them worry about precisely the point you raise in your op-ed, that this has been a sort of longstanding gambit by the North Koreans because, among other things, President Kim Jong-un benefits simply from meeting Donald Trump. And some of the darker interpretation I’ve heard is that they took these people hostage precisely so they could give them up and satisfy the need in the United States to see some progress. If we’re not going to get complete verifiable disarmament, is there anything short of that, in your view, is worthwhile for the United States to accept? Or is it all or nothing? MCCAUL: Well, I think that certainly—should be the goal, certainly, to prevent them from becoming a nuclear threat. I think the stakes are too high not to negotiate. I think everyone—you know, we’ve experienced the last several months of “fire and fury” rhetoric and on the brink of a nuclear ballistic missile being—intercontinental—being fired. And that got everybody a little frightened, to be honest with you. I think the rhetoric has toned down, but this campaign of maximum pressure, I think, is the right way to do diplomacy. I’m a historically, you know, Churchill fan. I think appeasement doesn’t always win the day. I think you negotiate out of a position of strength. And I think what the maximum campaign—pressure—has done is put an extraordinary amount of pressure on North Korea with the sanctions. I had General Mattis the other night and he said we use our military, extreme leverage with our military, so the diplomats can work it out. But he knows Kim Jong-un, he’s got the threat of sanctions, threat of a military provocation. Also, the key here has been China. Now, I don’t normally say good things about China, but in this case they’ve been very helpful. MCCAUL: They’ve been very helpful in this case. They’re in the—really the best position because it’s kind of like a bad stepchild next door. Yeah, they’re your stepchild, you got to deal with them one way or the other. And I think they’ve put a lot of pressure on Kim Jong-un. They want to maintain—see a communist buffer between the United States and South Korea and China. And so the goal—and I mean, obviously, missile tests; close the nuclear sites, only for peaceful; and then full inspections, anytime. LINDSAY: Well, inspections are going to be quite a challenge just given we know very little about the North Korean program. LINDSAY: What about the removal of U.S. troops from South Korea? MCCAUL: You know, they’ve been there since the Korean War. I think that should be an option on the table if we get these other promises. And I wouldn’t do that, I wouldn’t do any of this stuff—I wouldn’t lift sanctions, I wouldn’t pull troops out—until we see those signs, because in the past we conceded and then they played this game of waiting until another administration, and you see where that’s gotten us. I think it’s been mishandled by previous administrations, both Democrat and Republican, where we’ve gotten to this point where it’s a very difficult situation. LINDSAY: OK, let’s talk about China now. You have written that Chinese President Xi Jinping is—and let me quote you—“exporting his brand of colonialism with Chinese characteristics through soft-power means on a road toward achieving his hard-power ends.” Are we doing enough to curtail what you call President Xi’s long march? MCCAUL: Well, he’s declared himself essentially the emperor of China for life. He has a very ambitious goal, the Belt and Road, where he’s expanding into both Africa and the—and the Latin American hemisphere. He is in the South China Sea, parading through the islands. They have very aggressive cybersecurity ambitions. They stole 22 million security clearances from the United States government, including mine and probably many in the room, with virtually no consequences to that espionage action. So do I trust him? No. But sometimes you have to work with people like that to advance your negotiations with somebody like North Korea. They’re really the only partner we have that can pressure Kim Jong-un. But I see the threat from there. You know, the cybersecurity stuff is frightening. LINDSAY: Well, I want to get to the cybersecurity stuff in a second. But you raised, I think, an important point, which is that there are things that we are hoping the Chinese will help us with. We want their cooperation. But there are obviously things we want them to stop doing, and so we’re going to pressure them. It’s not just in cybersecurity. Obviously, the president sent a team to Beijing last week which made a very big ask of the Chinese on the trade front, and those negotiations seem to not gone terribly well. Just in your view—again, you sit on the Committee on Foreign Affairs—how do you think about how to weigh off—or the tradeoffs among those various priorities? Because, obviously, if you get China to force North Korea to give up its nuclear weapons, that would be a major strategic success. LINDSAY: But I would imagine the Chinese, like most anybody, would then say: Now you owe us one. MCCAUL: Well, I think that’s where the trade deals perhaps could come into the picture, that we’re willing to make concessions on trade if you’ll work with us with the North Koreans. You know, I saw the rise and fall of the caliphate under the tenure of my chairmanship, and we finally unleashed the generals and we had the Kurds to defeat ISIS in Iraq and Syria. There’s still a threat, but the bigger threat I see moving forward now are these foreign adversary nations—that being Russia, China, Iran, and North Korea. I think those states pose far greater threats to national security than these one-, two-man operations that ISIS is sort of denigrated to. LINDSAY: Let’s talk about cybersecurity. Obviously, it’s one of the issues that the committee you chair has to worry about. It’s pretty well-established that the Russians meddled in the 2016 presidential election. You’ve spent a lot of time being briefed on this issue. We are right now just a shade under six months out from the congressional midterm elections. You’ll be standing for reelection. How confident are you that we’re not looking at an election Pearl Harbor in 2018 with foreign powers, Russian or otherwise, interfering and disrupting the actual counting of the vote? Because during 2016 it was manipulating Facebook, maybe probes of state voter rolls, but to the best of our knowledge no actual manipulation of the data or the votes themselves. MCCAUL: That’s correct. And when I got the Gang of Eight briefing in October 2016, very highly classified briefing on this, when it did become public and I could talk about it, I immediately denounced what the Russians were doing, and I said there should be consequences, and we had to admit that it happened. What I didn’t like seeing was sort of a denial that it had taken place when the evidence, in my judgment, was so clear and convincing it was coming out of the Kremlin. And they did a campaign—a disinformation warfare campaign that did not impact the voting machines, but it did have a lot of social media out there. They tried to do this in France—it didn’t work—with Macron, as in Ukraine recently where they’re constantly doing this, and they’re also throwing every cyber tool—weapon they have, you know, into Ukraine. So I think it was important, also, to admit that it happened, and that Russia’s not our friend, and that there should be consequences to that. Which is why we voted for sanctions, finally, against Russia, because of that and what they’ve done in Crimea. With respect to the vulnerabilities and security of our next election, I can tell you that the Russians are targeting members of Congress, looking at ways to manipulate social media. That worries me personally—(laughs)—a little bit. But when it comes to the voting machines, most of them are not connected to the internet, and that protects them from that sort of incident. But we did just pass in the omnibus $380 million for grants for state and locals to help them with their election infrastructure. We also had a $30 million appropriation to the Department of Homeland Security. This is one of their roles they play, as one of the critical infrastructures. There are 16 of them, but the elections are now part of this critical infrastructure that we are now working with the Department of Homeland Security to ensure that our elections are not in any way manipulated. I worry they can manipulate early voting outcomes to try to deceive voters. If somebody’s winning and you haven’t voted yet, you may want to go with the winning person. And then we also know that the voter data rolls were vulnerable, so they could go in and change, say, a name and an address, and then—and then basically that person’s voice gets manipulated and the data is changed. That’s probably the biggest weakness I see right now, and that’s what we’re trying to harden. LINDSAY: Are there things that we should be doing right now? And when I say “we,” it’s not just the federal government. In many of these cases, it’s under the jurisdiction of state and local entities to take care of it. But are there obvious things that should be being done that aren’t being done? MCCAUL: Well, I think that protecting the voter data rolls is one of the keys. You know, DHS can’t mandate itself. It is state and local controlled. But we—most of them have asked for assistance. We encourage them to ask for assistance because the department has a lot of expertise. And I think, you know, with this grant program that we’ve seen of $380 million, you can see that Congress is taking this seriously. LINDSAY: You mentioned a moment ago the omnibus. And it’s—it is good that Congress was able to pass the omnibus, but a lot of sort of old congressional hands sort of viewed the passage of the omnibus legislation as sort of a great example of how Congress is not working the way it should. You’re supposed to have individual appropriations bills, broader issue here about Congress caught up in partisanship, in gridlock. I don’t want to idealize the good old days because throughout American history Congress has tended to often be quite lively, but you can look back during the Cold War and see times where bipartisanship did win out. And I guess two questions come from that. Sort of what it is like operating in an institution where partisanship and polarization seem to be the overriding characteristic? And do you see anything that could be done to change that? MCCAUL: Well, so my—this is my seventh term. It’s been 14 years. I think this is the most polarized and partisan I’ve seen, Congress. You’re right, the omnibus. We passed separate appropriations bills in the House. Senate couldn’t get their job done, so we get an omnibus spending bill. And nobody likes that, but we don’t want to shut down the government, you know, either. You know, the trend, I think it’s created by a couple things. I think the internet, while it can be a very good thing, has actually polarized a lot of voices out there. I also see the media getting more and more polarized. One channel’s the—basically the far-right view, and the other channel is the far-left view. And there’s a polarization within the country itself that we as representatives represent that. I don’t think it’s really healthy for the body politic, though, to have this. And we have it within my own side of the aisle, where we have divisions. And obviously, it’s better if we can work this out. My committee, and I think any national security committee, should try to avoid this instinct of being partisan. I think partisanship should stop at the water’s edge. Every time we go in a congressional delegation, we are not Republican or Democrat; we are Americans representing the United States of America when we go over to foreign countries. And that’s probably the last vestige of bipartisanship, you know, that I have seen. You know, and these districts are being drawn more and more to the left and the right. So I don’t—I don’t think that really helps either. The voices are getting more angry, less civil. I think you can make your policy arguments in a very civilized tone without being, you know, this uncivilized angry-mob mentality. I don’t know how to fix it, to be honest with you, other than the fact that out of my committee, with the exception of possibly one or two bills, I try to pass my bills unanimously, bipartisan. And then they go to the floor and they have a—they have bipartisan support on the floor. Committees like Homeland Security shouldn’t make this a—I mean, they’re not checking our party affiliations, ISIS and al-Qaida. They don’t care. They just want to kill Americans. So I think the chairmen set the tone on their committees. I think Ed Royce and Eliot Engel do a phenomenal job on the Foreign Affairs Committee setting that bipartisan tone of working together on national security issues. And, of course, the NDAA, which is the Armed Services, has always been a bipartisan document and agreement, and I’m worried that may be threatened this year. LINDSAY: The NDAA being the National Defense Authorization Act. LINDSAY: I want to ask one more question, Chairman, before I bring the rest of the room into it. And it ties back to where we began, talking about Iran, talking about North Korea, and the strategy of maximum pressure. And, obviously, when you think about that, all options are on the table, which means among them the use of military force. That gets back to a fundamental question about the nature of our democracy, our Constitution, which is that it is Congress’ role to declare war, to decide when to go from a period of peace to a state of war. We’ve been under two authorizations to use military force, AUMFs, one in 2000 with Afghanistan, one in 2002 about Iraq. There’s been a lot of talk on the Hill about either updating them, repealing them, replacing them. None of that talk has led to any change because of disagreements about what should come after. In your sense, are we likely to see anything change in the future? Is Congress going to continue to sort of sit on the sidelines? Is there a potential to craft some bipartisan compromise? MCCAUL: Well, I think that it really depends how Iran and North Korea play out. I think the AUMF passed after 9/11 dealt with al-Qaida. But you look at ISIS, they were al-Qaida in Iraq, and it’s radical Islamist terror that AUMF was intended to cover. But if you look at Syria and Assad and chemical weapons, that’s not—that’s not—I don’t—I would argue that does not fall within that AUMF. Or, if you look at Iran and North Korea, that does not fall within that AUMF. I personally believe that Congress has abdicated its constitutional Article I responsibilities by not passing an AUMF. And it’s not an easy thing to do; maybe that’s why. But, you know, when they presented in a classified setting why they hit the chemical weapons, it’s because under Article II of the Constitution the executive, the commander in chief, arguably has that authority. And this has been an ongoing discussion since the Founding Fathers about what do they mean by Congress has the power to declare war, but then the commander in chief has control over the military to make all decisions involving national interests and foreign policy? And I think that’s why the War Powers Act sprung out. And when they bombed the chemical facilities in Syria, we were immediately notified under the War Powers Act of that military action. But again, I think I would be open to entertaining that idea. Hopefully we won’t have to with Iran and North Korea, if we can negotiate a settlement that is good for all parties. LINDSAY: But wouldn’t you want to negotiate one ahead of time? Wouldn’t that add to the president’s negotiating leverage, that Congress is actually endorsing his threat? MCCAUL: And so we talked about this, you know, backstage. I mean, if you think about it, if you really want to apply maximum pressure, you can talk about the military, Mattis can talk about that threat and Pompeo can say this is what we’re going to do if you don’t give this up, and then we got China. But wouldn’t that be a bold statement by the United—the people of the United States speaking on behalf of their representatives with an AUMF giving the president authorized use of military force against North Korea or Iran? To me that would actually, I think, give him more leverage going into these negotiations. LINDSAY: But I think then, again, the counterargument for Congress would be once you delegate the authority, it’s very hard to take it back, as we’ve discovered. And then you’re basically relying on the president to act the way you’re hoping he would act, and presidents sometimes don’t act the way members of Congress wish they would act. LINDSAY: I think that’s one lesson I can draw from the little history I know. I want to bring the rest of the room into the conversation right now. If you’d like to ask the congressman a question, please raise your hand. I want to remind everybody that this conversation is on the record. I would ask, if I call on you, that you stand up, wait for them to bring the microphone, state your name and your affiliation, and please ask a question, and keep it short because I know there are a lot of topics I didn’t get to in this opening portion of our conversation. So we’re going to go to the gentleman back there. Q: Thank you. Lukas Haynes. I lead the David Rockefeller Fund. Congressman, I appreciate your commitment to nonpartisan oversight of foreign and security policy. Secretary Mattis has testified about the impacts of climate change on national and homeland security, and my question is whether the committee you chair or the committee you serve on are working on the issue, and whether you see nonpartisan interest in it. MCCAUL: Well, that issue’s gotten completely politicized, as you know. And, you know, the question is, are we going through a normal Earth cycle or is it—how much of this is man-made? I had a briefing by the scientists from NASA which was quite interesting. They’re not political. They’re just scientists, and they’re telling me about the satellites and what they’re seeing and that the oceans are rising, temperatures are increasing. And I asked the question, well, how much of that’s just a normal cycle the Earth goes through and how much can be man-made. His response, that he thought these coal-fired plants in China being lit up every week, that this trajectory was going to be too intense for it not to have been—had some impact from man. And so I think we’ve got people like Mattis talking about this responsibly, but I think it’s so politically charged right now that I think we have to take a step back and almost have a—no pun intended—a cooling period on this. But I think it’s a serious issue. It’s an important issue that I know the Defense Department’s looking at in terms of from a security point of view. LINDSAY: Right here at the front table. Q: My name’s Lucy Komisar. I’m a journalist. And I ask you this question as you are chair of the House Committee on Homeland Security. Do you have any concern about the Department of Homeland Security’s participation in the surveillance, infiltration and dismemberment of the Occupy movement, which was a peaceful protest by Americans particularly critical of U.S. financial regulatory policy—something which one would think citizens have the right to express themselves either individually or in an organized fashion? MCCAUL: Well, you know, we have a First Amendment to the Constitution. People are free to protest and speak their voice. I am not aware of any surveillance being done by DHS on Occupy. In fact, DHS doesn’t really have those surveillance capabilities. It’s the FBI that does. I’m not aware of the FBI doing that, but I’d certainly be open to looking into that. LINDSAY: Let’s go to the back of the room. MCCAUL: Yeah, I’m not—I’m just not aware of that. I mean, but I’m—I’m just honest. I’m—it has not been—certainly not in the jurisdiction I have within Department of Homeland Security. They don’t effectuate wiretaps. LINDSAY: Let’s go to the backroom. Gentleman there holding his hand up. Q: My name is Greg Aftandilian. I’m a former IAF and I’m at American University. Congressman, I was wondering your views on the Yemen crisis. I mean, certainly Iran has had a hand in that crisis, but the United States has been kind of indulging the Saudi war effort, and there’s been a tremendous humanitarian crisis there with, you know, people facing famine, cholera outbreaks, and et cetera. What are you suggesting the United States should do about this crisis? And do you think the administration should be trying to get some type of peace talks going? Thank you. MCCAUL: It’s a good question. So when Netanyahu told me about the Shia Crescent, he also included Yemen. And remember, we—basically $150 billion now have been lifted. And since that time, Iran has spent 40 percent in military efforts and we’re seeing their movements in the Shia Crescent in Iraq and Syria, Lebanon with the rocket manufacturing plants, Gaza, and then Yemen. This is what the Iran deal has produced, a—I would say a more militant, more money towards missiles as well. They’ve shot 15 missiles off. It’s provided more funding to expand their empire, the Persian Empire into these areas. The rebel Houthis are in Yemen. And you’re correct. And they fired rockets into Saudi Arabia. I can only imagine if our neighbor to the south was doing that to us, you know, how we would feel—or just like when Israel gets rockets from Gaza into Israel. But, yeah, I think it’s something that, you know, part of a broader strategy I know that the State Department’s looking at trying to resolve as we discuss these issues with Iran. But it’s a very dicey issue. And it’s just—it wasn’t the Saudis that started that. It was the Houthi rebels that went into Yemen and started to fire rockets. And it’s a very aggressive Iran, and Iran is more aggressive and more impactful, I think, because of the Iran deal. You can arm-wrestle for it. Whoever’s more assertive. You’re a very polite group here. MCCAUL: Jim, if I could just—thank you. If I could just add one more thing. I think when I—again, the prime minister—it’s amazing to see the Saudis and the Israelis actually form a sort of odd alliance. Who would think the Arab League of Nations would ever be aligned with Israel? And yet it’s the enemy of my enemy is my friend. So it’s Iran that I think is driving that alliance—which I find fascinating from a foreign policy standpoint to see—when I met with the crown prince or the prime minister talking nicely about each other. Q: So my name’s Andrew. I’m a grad student at NYU. My question—I’m going to stay on the Iran train. The Iraqi elections, I believe, are tomorrow, and you’ve talked about Iran’s and their influence in the Shia Crescent. Where do you see Iraq going forward after the elections, and do you think Prime Minister Abadi, if he were to win the elections, is still a viable U.S. partner? Some people are beginning to question whether or not the U.S. can still rely on him in rebuilding Iraq and the influence of Iran. MCCAUL: Well, and I’ve met with Abadi. I mean, he’s a Shia. We started to see them rely on the Shia militias to defeat ISIS because it’s the only ally they had. They don’t like the Kurds. So when they’re bringing the Shia militias into Iraq, that’s where I started to get a little concerned about Iran’s further involvement in Iraq. And now, of course, they’re, you know, in Syria, and Israel just shot missiles at them just yesterday. I worry about that election. Going back to Iran, though, I think the other impact that pulling out of the Iran deal is going to have on Iran is their economy. It’s going to greatly depress their economy. They don’t use the money to help their people out. They use the money to build rockets and to expand their empire, and they use it towards their, you know, military purposes. I think that the more it impacts the Iranian people—it’s not—we’re not against the Iranian people. We’re against the ayatollah—the ayatollah that came in in 1979 and changed the region to the present day. And I think that we missed a great opportunity with the Green Party in Iran. We could have stood with the Iranian people against this theocracy and this regime, and we didn’t do it because we wanted to have this deal. The deal was more important than—they didn’t want to, you know, hurt anybody’s feelings by embracing the Green Party. Well, I think if anything could come out of this, where the people of Iran could have an uprising against their theocracy, against the ayatollah and get a better form of government where they could be an ally again, that would be a good outcome. LINDSAY: OK, we’re going to go to your immediate left, and now you get a chance. Q: I didn’t have to fight anyone. Willow Thompson (sp), also an NYU grad student. Also thinking about North Korea and Iran together, doesn’t pulling out of the JCPOA telegraph to all future nuclear powers that they should only negotiate with the United States once they have a nuclear weapon? MCCAUL: Yeah, and I know that argument’s out there. I would argue, though, also that, again, it wasn’t a coincidence that the three American prisoners were released at the same time. So that action, if anything, shows to the North Koreans, you know, that we’re serious and that we’re not going to take a bad deal like we did with the JCPOA, that we’re going to—we want the best deal. And I think that’s—actually going back to maximum pressure and leverage, it puts more leverage on Kim Jong Un that we’re serious about this and we need results. LINDSAY: Come down here, right to the front. Going to try to get all over the room today. Q: Rob Radtke, Episcopal Relief and Development. If there’s a hallmark to this administration’s foreign policy, it’s a move away from multilateral regimes into either go-it alone or bilateral. And I wanted you to comment a little bit on that in general, but specifically our withdrawal from the Transpacific Trade Partnership and how that might play into our ability to constrain China in the region. LINDSAY: “He” being President Trump. MCCAUL: The president. I don’t want to be held hostage to all these other negotiations going on. I mean, you know—I mean, I understand what you’re saying. I will tell you in the Iran situation we’re in today, we really do need our allies to help us. I mean—you know, this will not be a one-on-one negotiation with Iran. We need the E3 and we need the European Union to help us leverage these negotiations to get to the point where we need to be. So I think John Bolton talked about this as well, is how important the European alliance is in this negotiation process. LINDSAY: Do you worry at all that our closest friends are reading this president’s decisions over the last 16 months and concluding that he’s not interested in their opinion? I mean, it seems to me that there has been a succession of efforts by the Europeans first to keep the United States in a climate agreement. That didn’t happen. Try to persuade the president not to move the embassy to Jerusalem. That didn’t work. Very high-profile efforts by Chancellor Merkel, President Macron to persuade the president not to leave the Iran nuclear deal. He did anyway. I mean, when I talk to at least some Germans, Brits and French analysts, they argue that the message being read in their three capitals is that they can’t influence this administration. MCCAUL: Yeah, and I—look, you know, there is some—it’s intense. There’s an intensity out there. I don’t—I mean, Macron had an excellent visit with the president when he was—after the State of the Union. LINDSAY: He got a very good reception when he gave his address to Congress. MCCAUL: And I—frankly, both sides of the aisle stood up and applauding him probably more than the State of the Union. I mean, we had a very good response to what he was saying, including his agreement to the three principles we talked about. LINDSAY: He was a bombardier in World War II. MCCAUL: He was a bombardier in a B-17, part of the D-Day air campaign. And I studied what Churchill and what Hitler did. Appeasement didn’t work so well with Hitler. And I think that’s a test of time. You negotiate out of strength and not out of weakness. I feel like this Iran deal is negotiating out of weakness and not really as much out of strength, and I think that’s what the president’s trying to do now is negotiate, you know, out of strength. One of the most powerful—and I’ll not digress too much—to lay a wreath at Normandy and all the white crosses and they play “Taps” and then you see Omaha Beach and Pointe du Hoc. It was a very powerful, moving experience. But then six months later you go to Auschwitz to see what they were fighting and that the sheer evil and the horrors, you know, of the concentration camp and the gas chambers and Dr. Mengele—it’s extremely disturbing. And I tell my children that’s only one generation away from me, even though for them it seems like, you know, ancient history. LINDSAY: My kids are the same way. MCCAUL: There’s a new exhibit at the Holocaust Museum in D.C. It talks about America’s view and role in World War II and, you know, the concentration camps, so it’s really a very interesting wing of the museum. LINDSAY: OK, we’ll go over here to this table. MCCAUL: Dina Temple-Raston with National Public Radio. And I wanted to ask you a little bit about cyber. And I wonder if you think that we need to change the conversation about cyber today. You’ve been quite clear here today that the Russians hacked the election, and our president has been a little more reticent to actually say that, and he has said that attribution for certain is impossible. But that’s not really true, is it? It seems that we can do attribution, but intelligence and CYBERCOM think by telling us specifically about who is behind cyberattacks, that somehow that diminishes their abilities. Do you think that we need to change this conversation so that all of us in the room have the possibility of clicking on something that ends up getting inside our companies? And this is a much broader conversation than what we’re having right now. MCCAUL: Right. So attribution, it’s very important. And when you have a foreign adversary meddling in our democracy, I think that’s one reason why that classified report was sort of made public to some extent, because of what was involved. Attribution’s not always that simple, though. But I can tell you in that case, it was clear-cut. And sometimes we can’t get the attribution right. And you have to get intelligence as well as digital forensics to know where it’s coming from. But this opens up on the Foreign Affairs Committee a whole new—there are no rules of the road when it comes to cybersecurity. We don’t have—it’s like a new frontier, a Wild West. There’s no international guidance. Like, say, NATO—would Article 5 be invoked if a NATO nation was hit in a cyberwarfare attack? A lot of unanswered questions. I had a bill to create a secretary of cyber diplomacy in the State Department, so we can have a better relationship with our allies as to what the rules are—and our adversaries—about what the consequences will be if you undertake this, if you steal 22 million security clearances, you know, if you meddle in our elections. But so far really haven’t seen a whole lot of consequences for bad behavior. I’ve got five teenagers. You know, if there’s no consequences, bad behavior’s going to continue. And I think this is an area that I find very interesting, because we are—you know, the legislature’s always behind cyber because it’s evolving so quickly. So attribution, a lot of companies do it. They cannot hack back by federal law. Some of them would like to, but it’s a role of the federal government to make that response. And what I codified in 2015 were the roles of the federal government in cyber. The NSA is the offensive, and defensive in a time of war, the FBI’s the investigative, but the Department of Homeland Security is a civilian agency that we felt was the best place to share the threat information with the private sector. And this is also in a post-Snowden environment. And that’s been the—that was codified into law when my bill passed. But, anyway, I agree with you on the attribution. LINDSAY: We’ll go to the center table. You still have your hand up, you get to go. Q: Thanks. I’m Todd Eisenstadt. I’m a professor at American University and a future IAF fellow working on climate change. And I want to thank the congressman for his moderate and realistic remarks, and I want to go back to a comment that you said—which was a quote—which was partisanship should stop at water’s edge. It seems to be a quote that our generation understands well, and it also seems that you have deference for the Greatest Generation, where they really understood that even more. I come, in part, representing students, undergraduates who are coming of age in a period of polarization and fake news. What they’re learning is that politics is divisive and that in fact opinions trump facts. And I’m very concerned that the answer to this that is being offered is inadequate. It seems that in political science we talk about redistricting and we talk about primaries and partisanship as part of the solution, but whether that is or not I think remains to be seen. It seems that sort of moderate and statesman-like members of Congress could do a lot more, such as sanctioning other members of their own parties when the tail of divisiveness and polarization seems to wag the dog of the U.S. role in the world. It seems like that’s what’s happening across the board. Can you comment on that and sort of look for ways forward beyond just having bipartisan sponsorship of bills? Q: I mean, it seems like we’re in a bigger crisis here. Thank you. MCCAUL: Yeah, it’s rhetoric, it’s tone. You know, when I grew up there were three network stations, and Walter Cronkite was the grandfather that everybody trusted. Bob Schieffer from Texas; that was my favorite show to go on, was “Face the Nation” with Bob Schieffer because he was like this statesman-like, grandfather-like type that was always fair. That’s not the case anymore. And then we have all these cable shows. We have all this spin out there. And you’ve got the internet where it doesn’t matter if it’s true or not, and it campaign—you know, it’s amazing what you see on the internet that has no basis in fact or truth. And I agree with you, it worries me about the students. You know, Jim was at the LBJ School in Austin, and I published a book called Failures of Imagination. It’s what keeps me up at night, eight chapters, including—this is in 2016—China influencing an election—because I prosecuted the Johnny Chung case looks at the director of Chinese intelligence putting money in the Clinton campaign. It turned out about a year later it was Russia doing it. But when I—they taught my book at the LBJ School, and I walked away—had a great discussion, but the professor said, you know, none of these kids want to go in to public service. And if we don’t have—that always—my dad inspired me to public service. Leaders like Churchill and Kennedy and Reagan inspired me to get into public service. But if we don’t have the youth, the millennials having any interest in getting in to public service, that worries me. I mean, it worries me a lot. And even my own children, they like to stay out of it, too. And, you know, it’s the tone and the rhetoric. I don’t know the answer—again, Jim asked me this question—or what we can do to bring the tone down. But I think, you know, a lot of it is, while the internet’s a great thing, it’s also—it can be used by ISIS or al-Qaida or people that want to spread venom, political venom throughout the internet. And you can’t really take that off. You can take some radical Islamist stuff off the internet, but you can’t—you know, freedom of speech protects this kind of rhetoric. I just would hope there’d be other leaders to stand up. And it starts from the top, to have the rhetoric of civility. You know, who would have thought that these statements are now by tweets. I mean, my own staff, they don’t allow me to tweet out, particularly at 3:00 in the morning. So that’s probably a wise policy for me at least. But that’s actually become for now a lot of (electives ?) now, that’s their statements. They tweet, you know, their statements out. LINDSAY: We’ll stay at the center table since you were kind enough not to arm-wrestle for the microphone. Q: Thank you. Thank you, Congressman, for your extraordinarily thoughtful, measured comments. You mentioned Prime Minister Netanyahu about eight to 10 times as shaping your thinking, and you also mentioned the new king—the Saudi prince, MBS, a couple times. But in Israel, there are views on the JCPOA and the Iran situation, particularly in the Israeli military, the Israeli intelligence and national security world, which are supportive of the JCPOA. And our own General Mattis has testified in Congress and made a very forceful argument for staying within the JCPOA. I was wondering whether you could comment on how much weight should their perspective be on how we approach this situation? MCCAUL: Yeah, I thought we would have had an extension period, quite frankly, where we could continue to negotiate with our allies and our European partners. The decision’s been made, and now you’ve got the 90- to 180-day window. And the stakes couldn’t be higher. LINDSAY: Go to this table right here. Yes, you’re—this is the most polite group. Usually people are seizing the moment? Q: Sinem Sonmez, professor of economics at Baruch College. Do you foresee the U.S. troops staying in (Manbij ? ), Syria for a long time to deter Islamic extremism and the influence of Iran in the region? Thank you for your comments. MCCAUL: It’s a great question, and I asked Richard—I don’t know if he’s still around—we talked about this very issue. When I get briefed, I asked a question to Homeland, and so that’s why we have the Delta forces and the troops there. Also the other goal is to prevent chemical weapons agents—you know, going back to World War I—being used in violation of international law. And the third one is to help provide political stability to Syria. It’s been a brutal civil war, massive refugees. It’s been the worst conflict, you know, of this century. And it’s a very complicated issue because now you have the Russians in there. Remember, they came into Afghanistan in 1979; now they’re back in the Middle East again. They have two ports in the Mediterranean. They’ve got their submarine warfare—submarines out there that can deliver nuclear weapons. They have stabilized Assad, which is what they wanted to do. And now, with the Iranians moving in—and then Turkey fighting the Kurds, who we were fighting with to defeat ISIS. Can you see what—this is the most complex foreign policy issue you could ever imagine. And there is no easy solution to it. So when I was with the intelligence people, I said, so, what do you recommend we do? They said make sure ISIS is not a threat to the homeland, not to, you know, condone chemical weapons, and try to provide some diplomatic solution. Either than that, we have no friends there. We have no friends in Syria. We did fight with the Kurds and the YPG. But again, the Turks think they’re terrorists. It’s very, very difficult. So in light of that, I think the days of occupying countries like Iraq and Afghanistan are over. I don’t think there’s any political appetite for it with the American people. I do think a residual force is a good idea, but I wouldn’t recommend escalating that American presence. LINDSAY: Chairman, could I draw you out a little bit on your comment about political appetite? I’m just curious. You represent a very diverse constituency. How much do you hear from your constituents about any of the issues we’re talking about today? What are you hearing from them? Or are they more focused on domestic issues—taxes, regulations, things like that? MCCAUL: Well, I think, you know, usually the economy is key in elections. You know, we can debate the merits of the tax cut bill. A lot of my constituents like that. Some. I understand New York because you can’t deduct your property taxes. Don’t want to bring up that ugly subject. But I am kind of—I do find it interesting in the level of interest in foreign policy matters because there’s so many hotspots right now. And one thing that attracts me about potentially chairing the Foreign Affairs Committee is we’re moving from this ISIS threat to nation-state foreign adversary empires: Russia, China, North Korea, Iran, to name a few. And I think there’s a high level of interest with my constituents about what’s going on, because this is about war and peace. This is about nuclear threats to potentially the United States and others. So that very much gets their attention. LINDSAY: OK, in the back of the room. Q: Hello, Congressman. Thank you for your remarks. I’m Imran Chowdhury from Pace University. With respect to the issue of foreign intervention in U.S. elections, do you think Congress would consider investigating a move towards hand counting of paper ballots in public as a way—as is done in many countries—as a way to kind of ensure the security of our elections, particularly with respect to, you know, these issues that might surround electronic voting sheets? Thank you. MCCAUL: Yeah, and so you want a redundancy in the system, whether it be electronic or paper. It’s really—as Jim mentioned, this is more of a local—a state and local issue. They control the elections, not the federal government. But I know there are some states that are looking at going back to a paper ballot, or at least a backup, because I think it’s important there be some redundancy in the system. It’s important to note, though, that none of the machines in the last election were impacted or tampered. A lot of campaign disinformation warfare that was out there, but none of the machines were impacted. We want to make sure it doesn’t happen in 2018. LINDSAY: OK, we have time for one last question. Ma’am, you have the last question. Q: Hi. Thank you. Ahram Herr (ph), faculty fellow at NYU. We talked a lot about sort of the U.S.’s minimal line before it pulls back from negotiations with North Korea. So I have a very simple question: What do you think the minimal line is for North Korea before it pulls back again? I do think that this time is a little bit different. It’s been very orchestrated, very sequential. You know, he went to China, South Korea, and now he’s meeting with the U.S. So clearly he wants something, and I doubt that it’s just lifting of economic sanctions. And if it’s something more long term than that, you know, if you have any thoughts on what that might actually be. MCCAUL: Well, again, I think China’s putting a lot of pressure on him. That’s been very helpful. We’d like to see him join the international community, and that would be economically. His country, I mean, they put all their money into the military, kind of like Iran, and the people are really suffering in North Korea. It’s a brutal regime and people are starving. And so I have to—I was a little surprise when this sort of like kumbaya moment—(laughs)—occurred. I honestly didn’t expect it. And I think that’s because of the pressure that’s been put on him, and I do think the sanctions have really had an impact. But again, I would not recommend lifting the sanctions until we see good-faith efforts on their part to stop the missile testing and to shut down their nuclear weapons sites. Anything short of that will ensure a nuclear North Korea, and we know their track record. We’ve seen it many times in the past, where they play this dance of negotiating and then they pull the rug out from underneath us. LINDSAY: Is any congressional action required to lift any of these sanctions? MCCAUL: We can apply, but no, these are—yeah, we can—we can have some, but right now we’re not. But these sanctions have been placed on him. I don’t see any lifting of that. I would prefer to let the executive use their diplomatic and State Department leverage to negotiate a better deal before Congress starts to intervene and start, you know, pulling off—pulling back the sanctions.